Okay, let’s look at some numbers. As a marketer, you may be sold on the importance of lead nurturing, but perhaps not have had similar overwhelming results when performed. Not to sound sassy, but the reason why lead nurturing is not working for your SaaS business could be because you’re not doing it right. In a previous post, I talked about the different types of possible lead nurturing campaigns for SaaS. In this post, let’s clear up some of the confusion surrounding its implementation and dig out the best practices for setting up a program that works. Before beginning with any type of communication with your users, it is important to understand them. Developing buyer personas could be helpful for this purpose. Hands down, the most important thing for lead nurturing is to tailor it to your buyer persona. 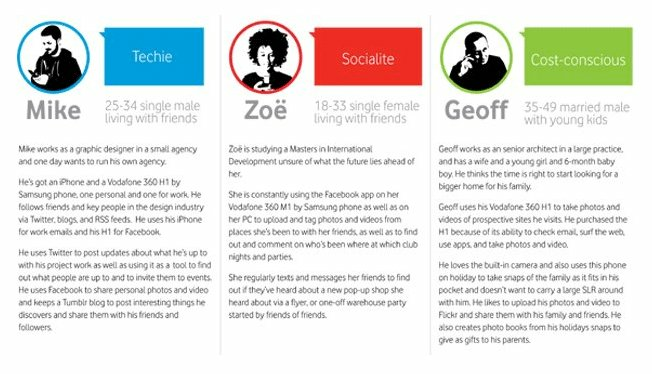 Buyer personas are representations of your ideal customer: their demographics, goals, challenges. When you’re creating your nurturing workflow, it’s important to position your emails to address this ideal customer so that your messaging is relevant, which will increase engagement. Send the right content this persona would be interested in. Buyer persona profiling allows you to bucket your audience based on their behaviors and actions. To create buyer personas, you could either gather insights from your existing user base or conduct interviews with your users. For SaaS companies with several pricing tiers (and product bundles), creating multiple personas may be helpful. Watering Holes: Where do they hang out and consume information? Perhaps knowing the blogs or social media platforms they closely follow. Here’s an example of multiple personas. Note that the areas of interest and preferences would be different for all the three personas, and hence should be catered to differently. You could also look at this comprehensive guide on developing buyer persona for your SaaS product, for further knowledge. Now that you have defined the type of people buying from you, the next step would be segment your existing database on the basis of the campaign you want to run. According to the 2015 Lead Nurturing Benchmark study by DGR, nearly six in ten B2B marketers said that segmentation based on interests and behaviors helped them improve their lead nurturing programs. About two-third of them said such efforts drove better responses to campaigns and offers due to targeting and relevancy. Segmenting based on lifecycle stage of the user is invaluable in setting up nurturing programs. Along with your buyer personas, knowledge of the lifecycle stage of a user helps you decide the right communication and content down to a tee. Find out more about how to map content pieces to the right lifecycle stage. After you’re done deciding on the basis of your segmentation, the next step is to implement it. For that, you can either add a field in the signup form or use simple email marketing tools like Mailchimp, Vero or Intercom. See how Intercom allows segmentation based on filters, segments and tags. You could also send out a survey to your existing customers to better sort them into different segments. Look how Aweber allows segmentation based on user feedback. Your leads won’t be convinced to buy your product with the first email you send them. They have to be systematically enabled to make a purchase decision through a series of touch-points. These workflows could then be automated based on your user’s previous actions. This extract from an infographic by Pardot explains how a lead nurturing workflow could possibly work. 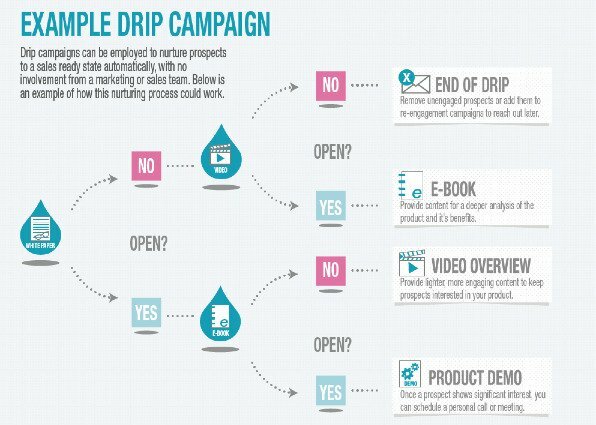 The example shows a lead nurturing workflow based on open rates. You may want to chalk out your strategy keeping in mind the buyer persona profiles that you created earlier. A lead nurturing calendar could be an effective way of organizing the workflows and assigning responsibilities. The visibility of a calendar helps to remind everyone of an ongoing flow and avoid any overlapping of emails. This is one way to define your lead nurturing calendar for a seven-day trial. For a 30-day trial, you may want to send out the emails in this order. Personalization doesn’t and shouldn’t stop with “Hi |FNAME|”. According to National Client Email Report by DMA, over 75% of email revenue is generated by personalized triggered campaigns, rather than one-size-fits-all campaigns. Personalized greeting, along with a well-thought-of backup for contacts who have not provided their first names. Using an individual “from name” and email address, rather than the company name. You may also want to add a picture of the team member or signature at the end. Exclusive content based on the user’s interests and preferences. A CTA which could direct them to the next steps like product demo, signup, etc. 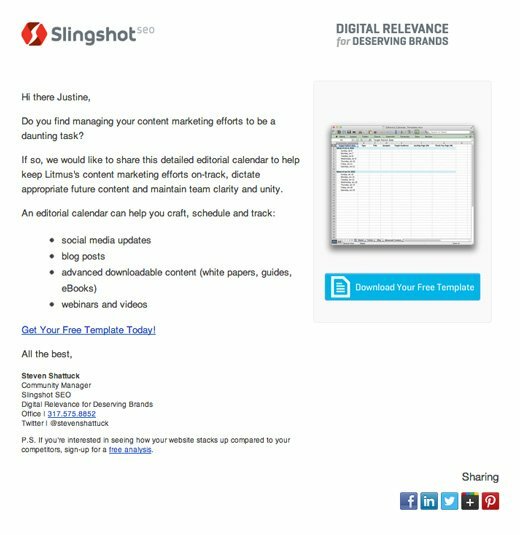 See this great email by Slingshot SEO, especially designed for its top of the funnel leads. However, it is important to not go overboard with personalization. Personalizing too early or too much could also be bad for your business. There is a long-standing debate on the best time to send a business email. Weekday or weekend? Morning or evening? Expert opinions vary greatly in this topic. 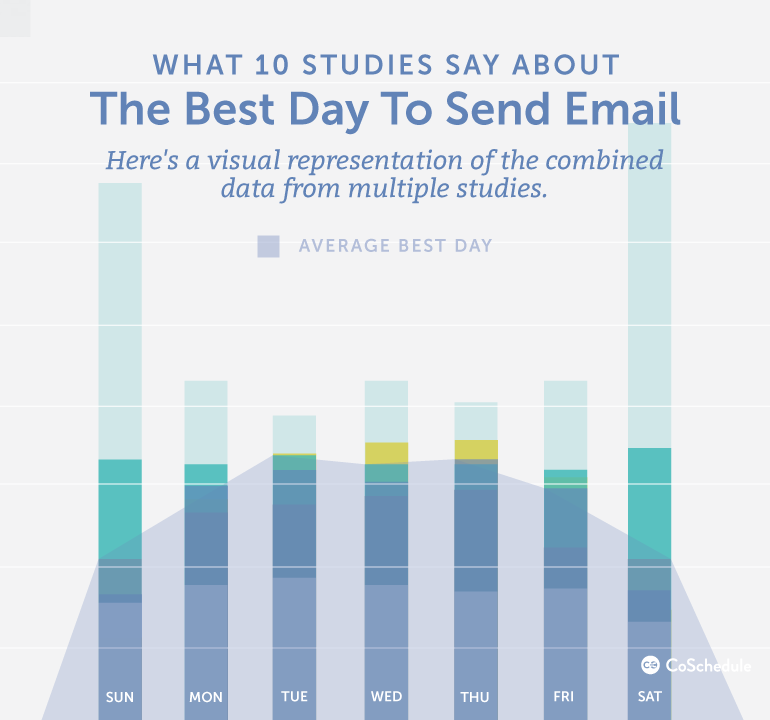 The image depicts data by ten different studies on the best time to send an email. And that is because the “right time” for any email campaign is very product-specific. While you can take into account some of the obvious factors like time-zone, offer type, etc, a large part of finding the right time would depend on testing. Make different segments to test the time that yields best results for your emails. Track the CTR and open rate, type of device, etc to find the perfect timing. You can track your emails via google analytics or the specific email marketing tool that you’re using. While emails have proven to be an important and effective channel for nurturing, there are other popular channels that you shouldn’t overlook. Subtle touches like following a lead on Twitter or liking their update on LinkedIn are becoming legitimate ways of making them remember you. This list of social media marketing tools could help you maintain engagement. Other than that, you could also come up with a creative social media campaign, depending on your end goal. See these 25 social media campaign ideas for inspiration. Retargeting is proactively reaching back to prospects who have shown an interest in your product. An email lead nurturing campaign also banks on the same principle. But there are other mediums like social media, website ads, etc which should not be ignored while retargeting. These are some helpful tips and tools for retargeting. Finally, you sent out your lead nurturing campaign. But what now? How do you measure the performance? How do you improve it? According to Unica’s State of Marketing report, 57% of marketers cited “measurement, analysis, and learning” as the biggest bottleneck they face within their organizations. Open rate – Could help determine how many people are interested in listening to you and at what time. Click through rate – You could know what type of content is resonating most with your audience. Bounce rate – To measure if your users are finding your content relevant. Unsubscribe rate – How often are people unsubscribing from your email list? Possible reasons? Forwarding rate – Could determine the virality of your content. List building rate – What rate are you acquiring leads? Any specific factors affecting it? Although all of these metrics would vary with your product type, you could look at the industry standards to measure your performance. According to a research conducted by Mailchimp on its customers, average open rate for SaaS came out to be 21.56%, CTR 2.4% and soft bounce 1.11%. Look at VWO email analytics dashboard on Hubspot for five different types of email campaigns. Also, make sure you have tagged the URL links that you’re providing in the mail. This will allow you to track the email generated traffic on google analytics easily. Lead nurturing takes a bit of effort to get right. The toughest bit is understanding your users well enough to be able to identify their challenges and proactively step in to assist. With dozens of tool at disposal, getting the processes right is a matter of continuous monitoring and iteration. At VWO, we ourselves are in the process of optimizing our nurturing process. I’ll keep you posted. Have you tried putting a nurturing plan in place? If yes, I’d be curious to know the challenges you faced in setting it up and your most valuable learning from it. Write to me in the comments below. Majored in English literature and currently working with content at VWO. Loves her coffee, books and movies. The clearness in your post is just nice about effective practices for saas lead nurturing campaigns and i can assume you’re an expert on this subject. Thanks and please keep up the gratifying work. Great article- super helpful while I am crafting a new nurture program. Thank you!